WHEN soap star Carli Norris was offered a stage role in ghostly chiller Turn Of The Screw, there was no way she was going to turn it down. “I remember reading the book when I was young and I was fascinated by it,” says the actress who has appeared in EastEnders, Hollyoaks, Holby City and Doctors. “Then last year I saw the poster for Turn Of The Screw and I said to my husband ‘We must go and see that, it’s a really good story’. 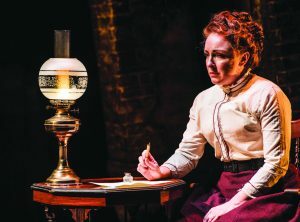 Turn of the Screw comes to Guildford’s Yvonne Arnaud Theatre from Tuesday (24 April) to Saturday 29 April.